Over at the WoT forum, Nicholas “The Chieftain” Moran has posted a new article about the development of the Tiger II tank. Excerpt below, read the full article here. VK 45.03. Tiger III. Tiger II. Tiger Ausf B. And they’re all the same tank. Even after reading and re-reading the books on King Tiger’s development (Notably the Jentz/Doyle one), I’m still a little confused, though perhaps a little less than some. You’d think that a country with a reputation of organization such as Germany would have had a system which was easier to decipher, but as Hilary Doyle intimated in Operation Think Tank, the various companies all competing for contracts tended to be as much interested in the money as they were their patriotic duty to see the war won. Doubtless the winds of fortune changed as the company leadership leaned upon their patrons in the political hierarchy which had no small role in the development of vehicles by the middle of the war. Anyway, since the VK 45.03 premium tank is now on sale, let’s have a look at the background. This past weekend, the last Tiger II tank in running condition was featured at the Paris Retromobile show. 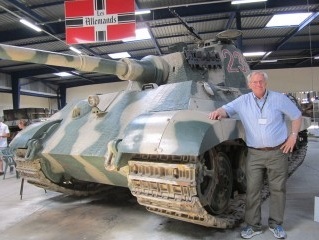 This tank normally resides at the Musee des Blindes in Saumur, France. Several videos have appeared on youtube documenting this historic vehicle arriving at the show and moving into position under it’s own power.